The first of the Daylilies started blooming this week, but when I went out with the camera yesterday the flowers had closed. Today, another blossom and another chance. When first married I once decorated the table for a small dinner party using tiny glasses of Daylilies, as I had seen my friend Janice do when visiting her just a few days earlier. Just before the guests arrived I checked the table one last time only to discover the Daylilies had all tightly closed. 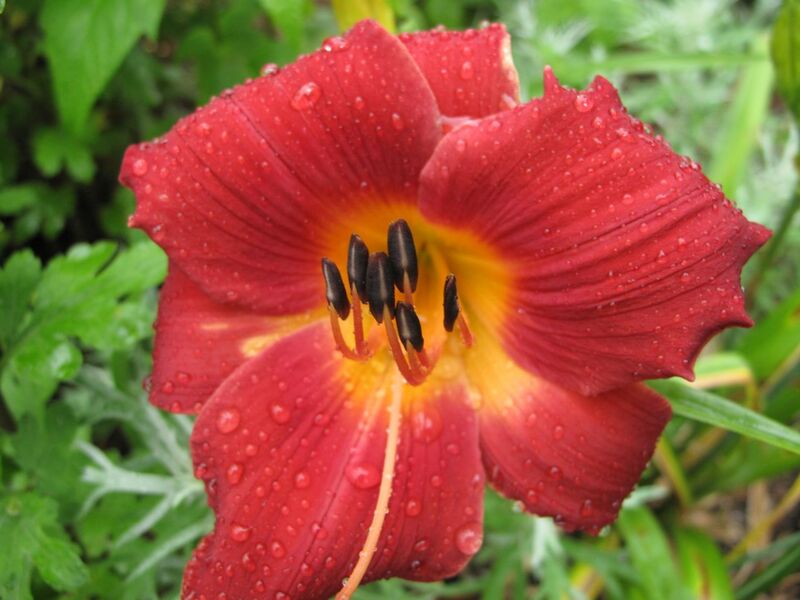 Suddenly I remembered my friend’s beautiful centerpiece had graced her table at brunch, not dinner, and I realized how Daylilies got their name. 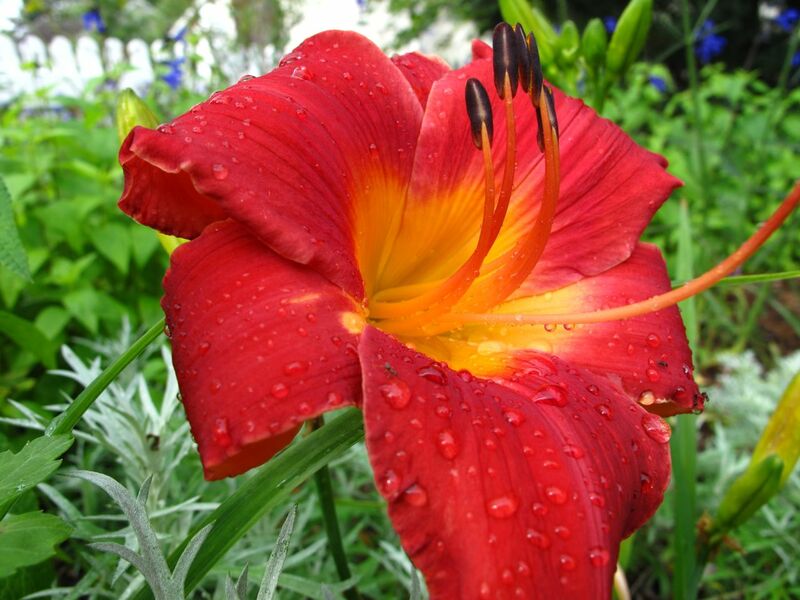 This entry was posted in garden and tagged daylily on June 19, 2013 by pbmgarden. 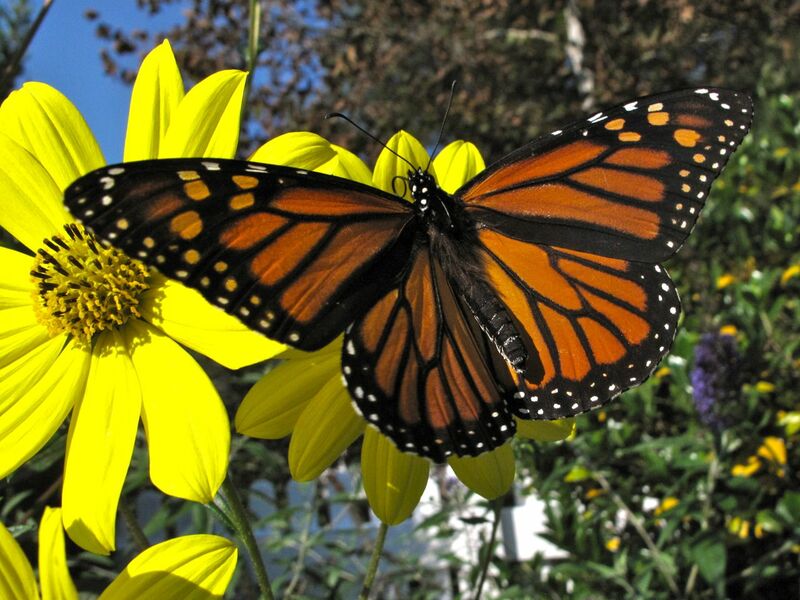 Among the bees and many other insects enjoying Helianthus angustifolius (Swamp Sunflower) today were many beautiful Monarch butterflies (Danaus plexippus). I think these are female but am not sure. 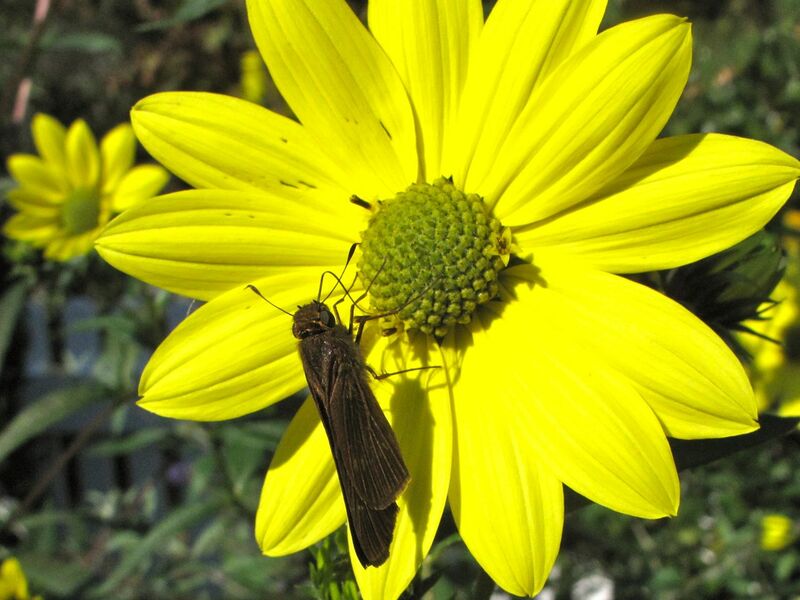 Swamp Sunflower is a native plant but spreads too easily and is difficult to control. I did manage to dig up one new section of this plant that had begun to grow. 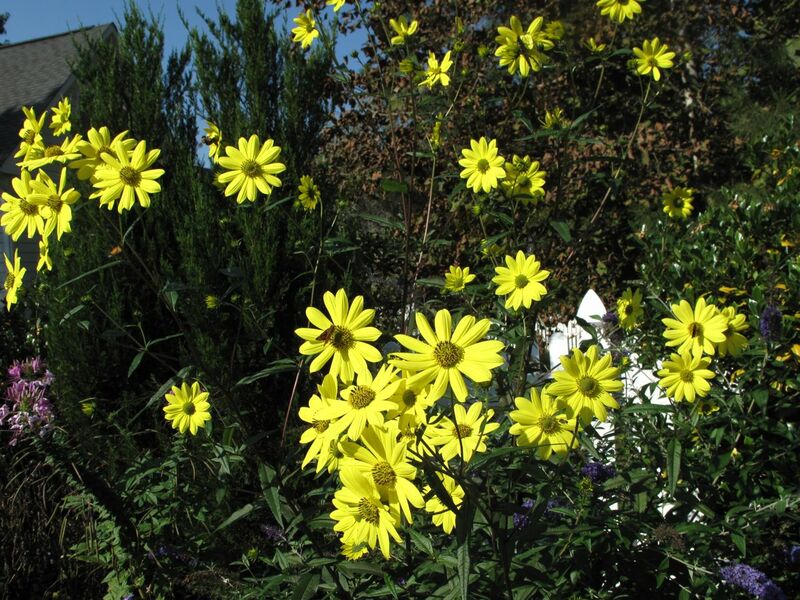 It is hard to deal ruthlessly with this or any plant that is blooming with such sunshine and cheer. It was nice to have such interesting company in the garden today as I continued digging out errant mounds of common daylilies. 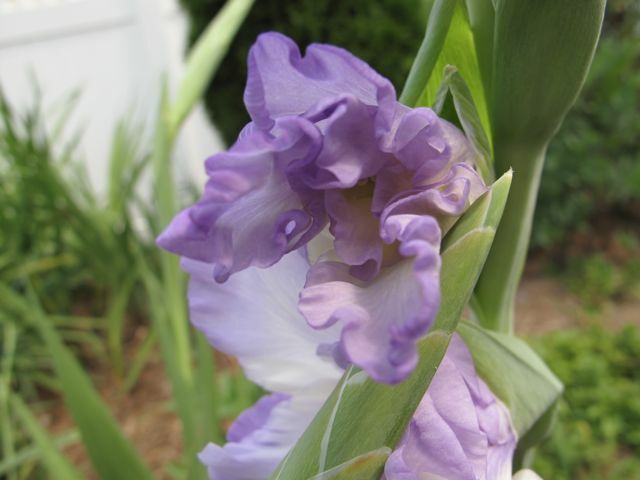 I keep hoping I am not also mistakenly taking out irises that I thought were growing in this area as well. I am trying to clear out enough room to plant some new evergreen trees, additions that should provide much needed verticality and year-round structure to the northern border. 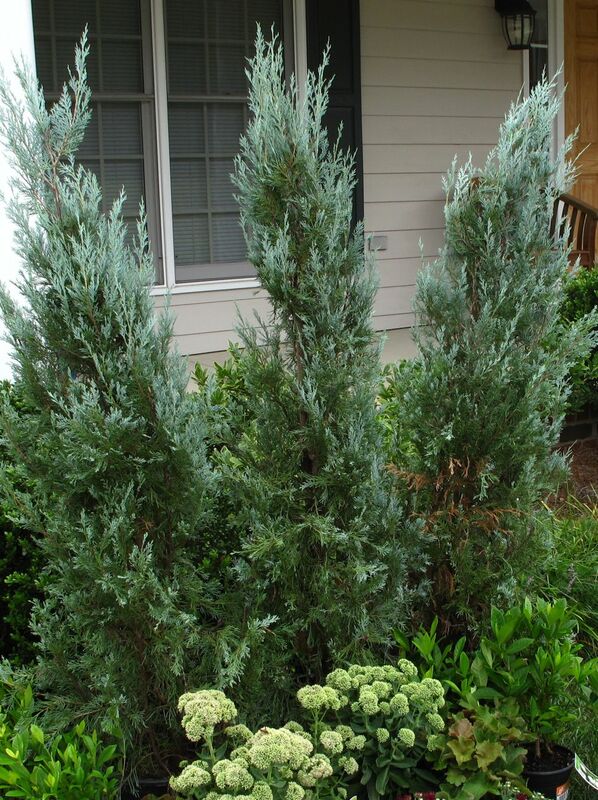 The trees, Juniperus scopulorum ‘Wichita Blue’ (Juniper), were purchased on a whim more than a few weeks ago. I know well that I should never buy anything without having a place already prepared where I can plant them right away. Being such an undisciplined gardener it is a lesson I learn and apparently ignore over and over. 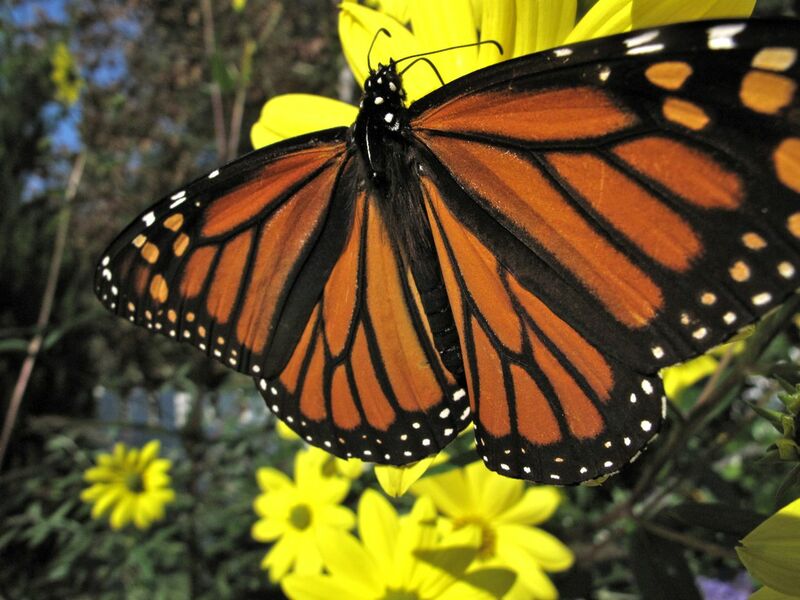 This entry was posted in garden and tagged 'Wichita Blue' Juniper, daylily, Monarch, nature photography, photographing nature, Swamp Sunflower on October 6, 2012 by pbmgarden. Daylilies have been blooming all over town this week and this morning I was delighted to see one of my Mercer daylilies has opened. 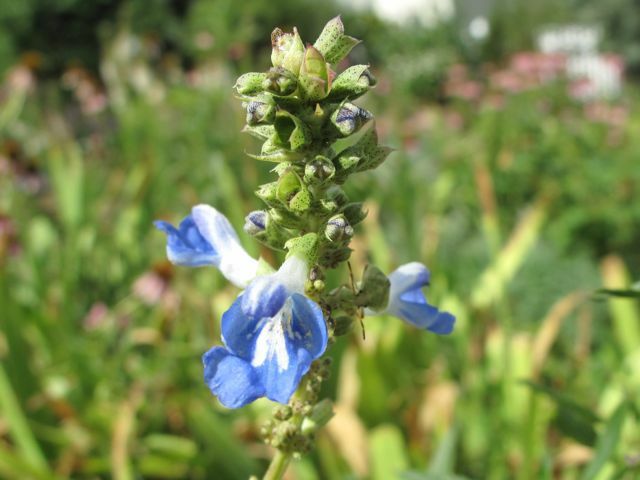 The actual name of this hybrid is, for all practical purposes, lost (although the plant tag is surely stored somewhere safe, awaiting the transfer of all pertinent information, including the name, into my garden records). Update June 4, 2012: This was dug up from a field after I selected it so there probably never was a tag after all. 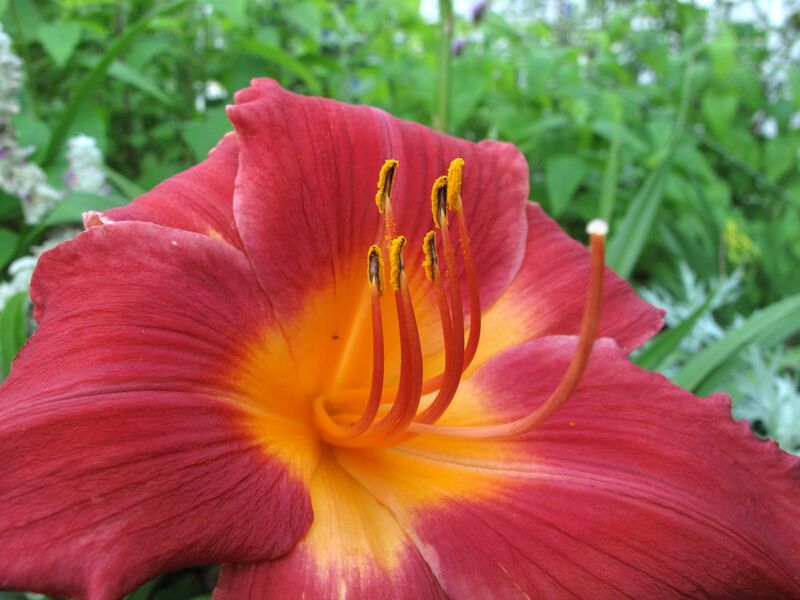 This daylily was bought in 2006 at Roger Mercers’ Garden in Fayetteville, NC. 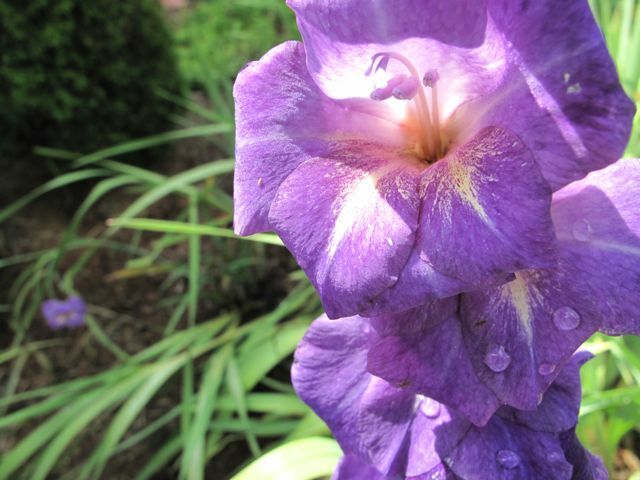 That year my sister, my daughter and I spent a fun morning exploring Roger’s daylily fields. 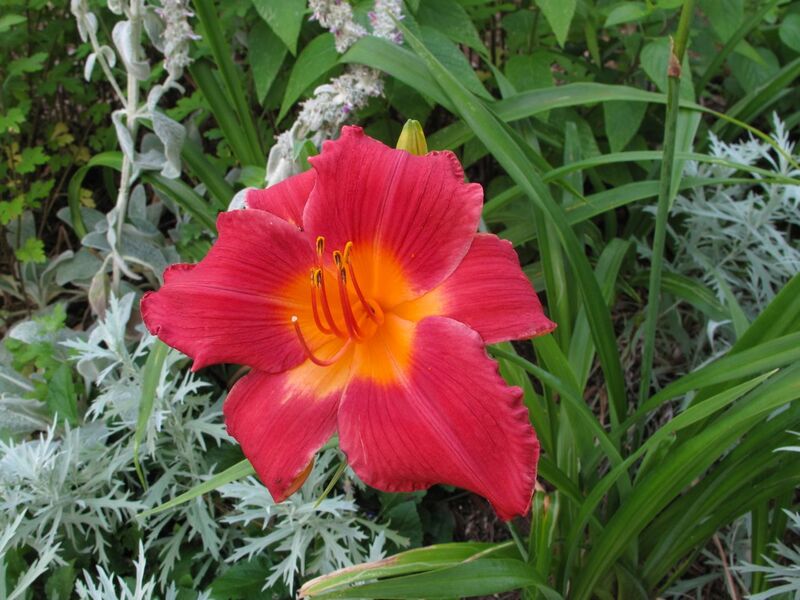 We each came home with a variety of specimens, having had to make agonizing choices from among many enticing daylily offerings. During the past year, first my daughter and just recently my sister have relocated to new cities, leaving behind their daylily selections from that day. But this garden, established in 2001, turned eleven years old today! If the picket fence added last year to this garden continues to keep the deer at bay, the Mercer daylilies will continue to bloom here as a nice reminder of a special day we three shared together. 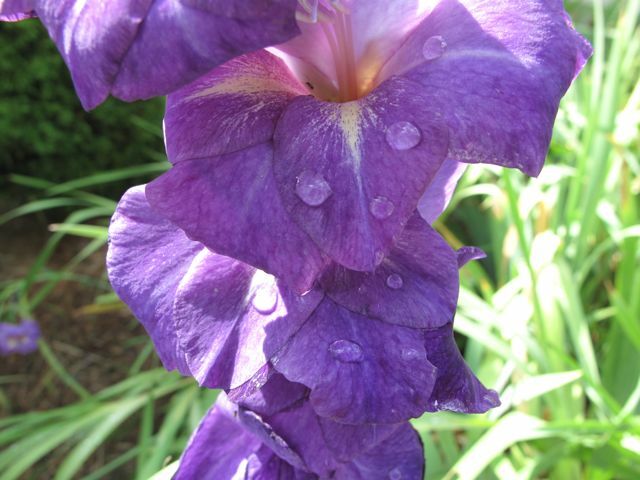 This entry was posted in garden and tagged daylily, memory garden, nature photography, photographing nature, photography on June 1, 2012 by pbmgarden. Rainstorms swept through the region this week, missing this garden more times than not. Big splats, soft mists, ominous thunder, but often it was not even damp under the trees by the end. 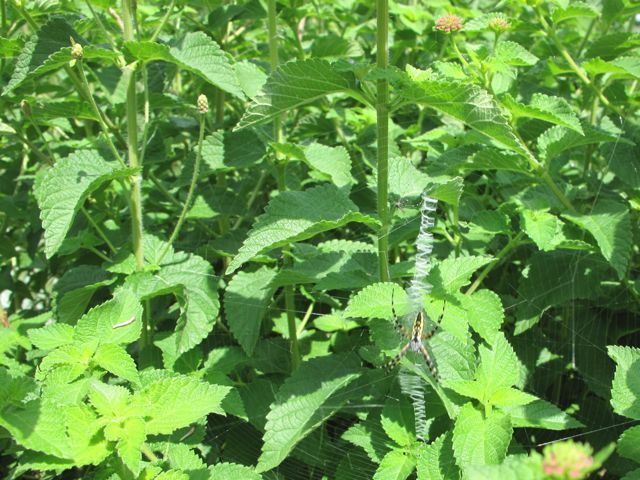 The flowers seem revived nevertheless and the first of the Cleome (Spider Flower) and Canna opened. There is a lot of activity in the borders. 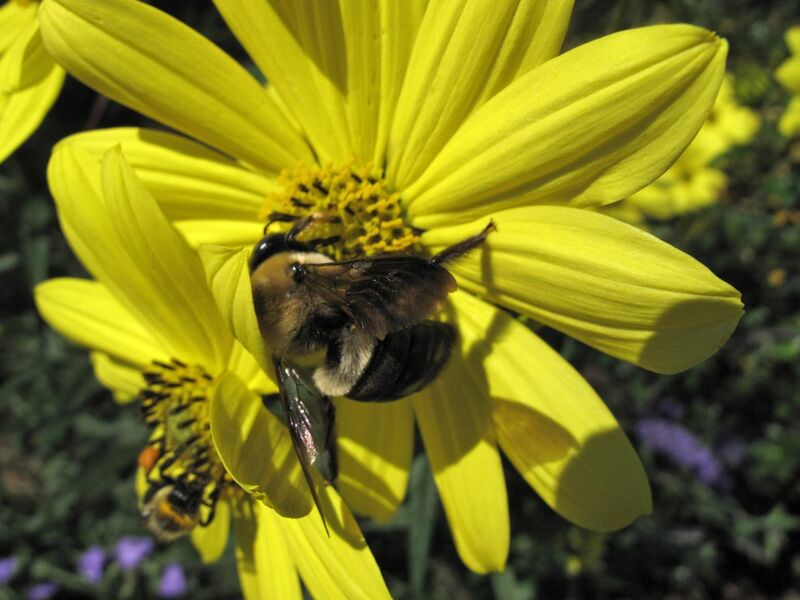 Echinacea (Purple Coneflower) is popular with a great variety of bees, moths and other insects. Hummingbirds regularly visit the Monarda (Bee Balm) while American Goldfinches enjoy Verbena Bonariensis. Unfortunately deer jumped the new fence this week to nibble on the daylilies and to devour a container of ornamental Sweet Potato Vines, putting an end to thoughts of keeping the daylilies and even reintroducing Phlox paniculata ‘David’ to the borders. 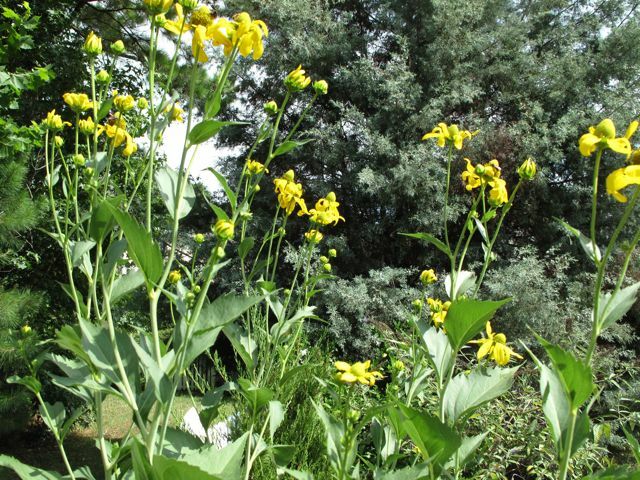 This entry was posted in garden and tagged canna, cleome, daylily, deer, echinacea, gladiolus, lantana, monarda, phlox paniculata, rudbeckia hirta, Salvia 'Blue Sky', shasta daisy, verbena bonariensis on July 9, 2011 by pbmgarden. The neighborhood deer could jump the new fence, but for now have been deterred from entering the garden. 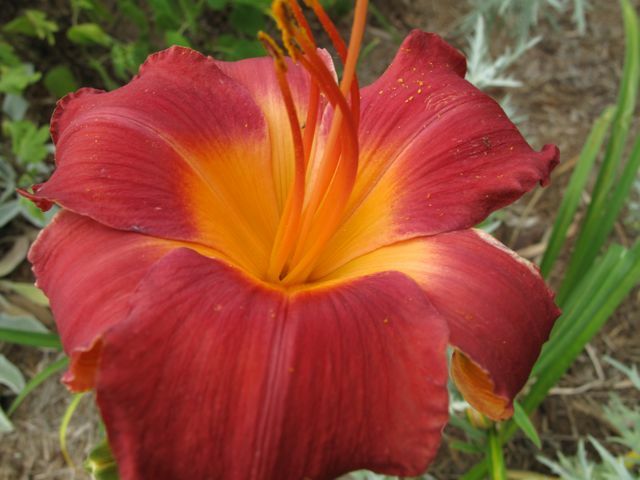 So, for the first time in many years, a few daylilies have been blooming in the garden. 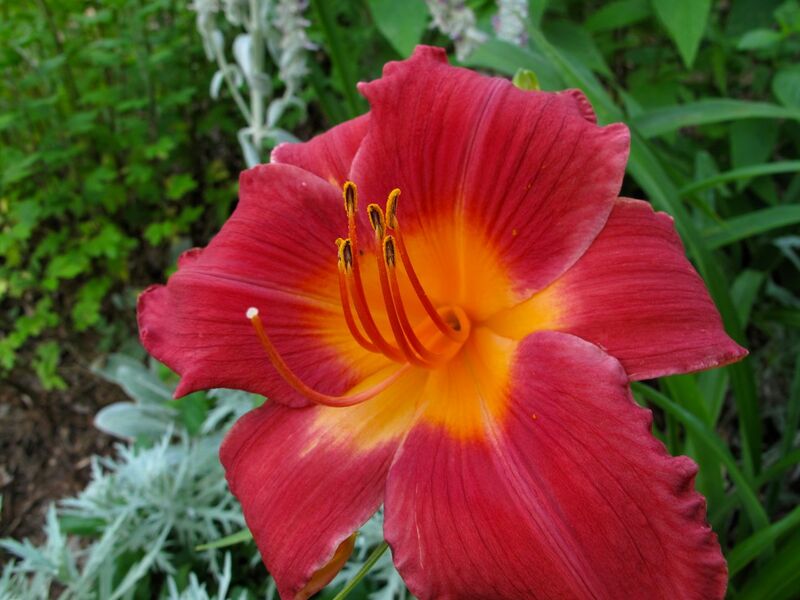 This one was purchased from Roger Mercer at Mercers’ Garden in Fayetteville, NC, during a fun excursion to his daylily farm with my sister and daughter before 2006. The cultivar name is lost to me now, but it is nice just to see the flower at long last. 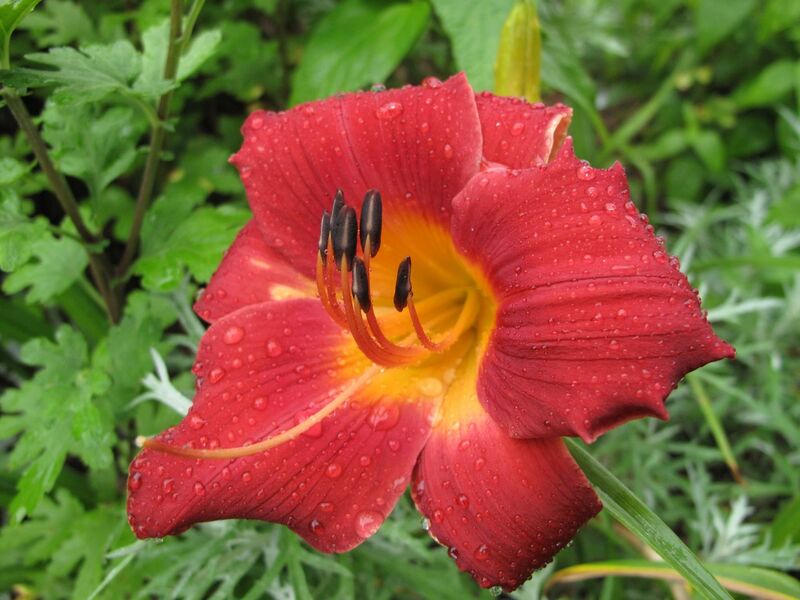 This entry was posted in garden and tagged daylily on June 20, 2011 by pbmgarden. The garden is holding up well this week despite a lack of rain or watering. 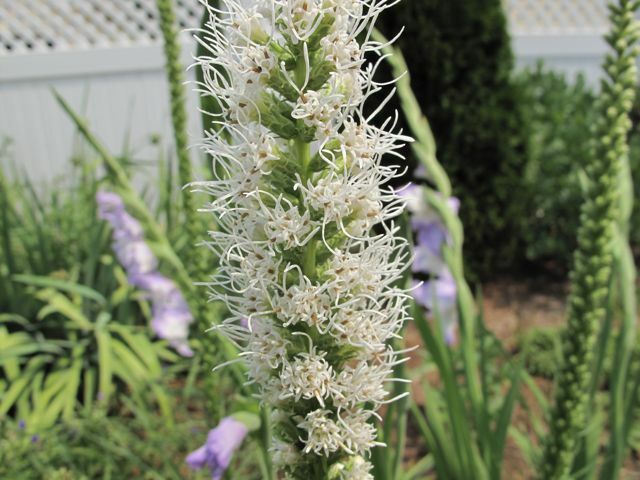 In the northern bed Echinacea (Purple Coneflower) and the first blooms of Liatris Spicata ‘Alba’ (Gayfeather or Blazing Star) and Gladiolus dominate the view. In the southern bed, sweet peas and pink yarrows are still pretty although the color is fading on the yarrow. 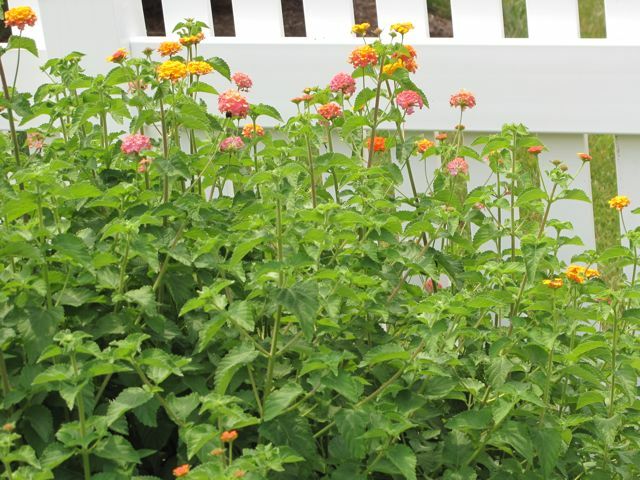 Mexican salvia, with its intense blue flower is coming into its own in the southwest end of the bed, while Lantana, with its multicolor flowers, fills out the southeast corner. 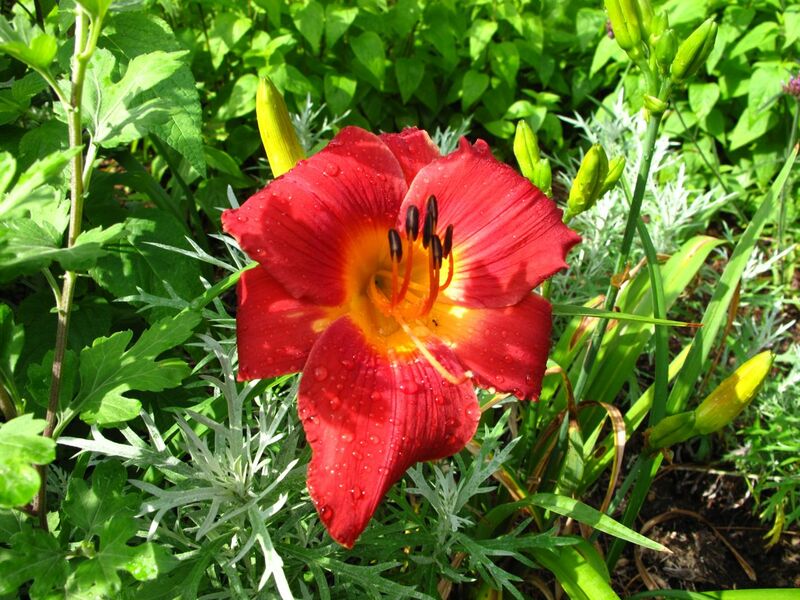 Daylilies, which I had many times threatened to pull out completely in an attempt to keep deer away, have persisted and (now that the fence has deterred the deer so far), they may actually bloom this year. 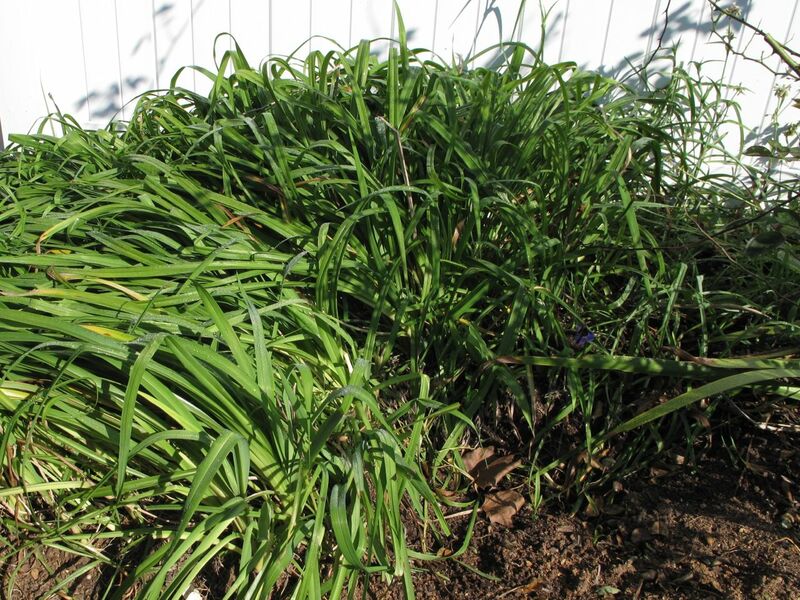 The tradescantia (Virginia Spiderwort) is winding down its long blooming period that started in early April, so I cut down most of it this week. I had never noticed a sensitivity to this plant before, but I developed an itchy red rash on my arms after carrying the trimmings away. The rash lasted a day or so; fortunately the itch lasted only a half-hour or so. 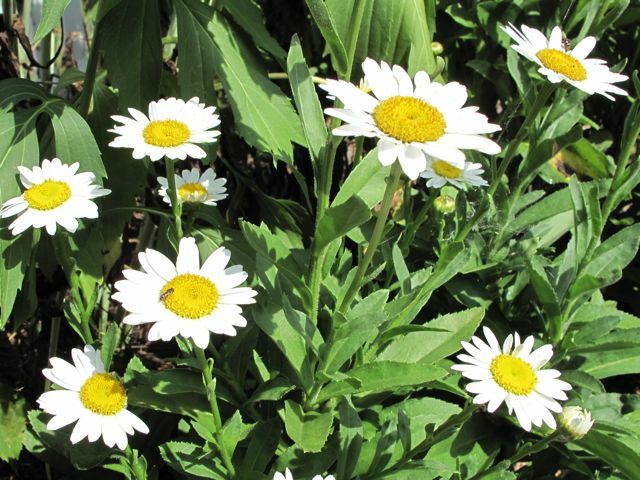 Several Shasta Daisy flowers opened last week but as a group they are blooming very slowly. 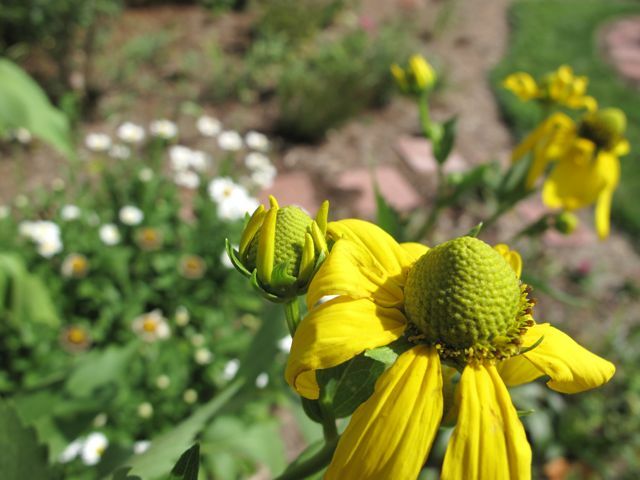 The Rudbeckia hirta ‘Irish Eyes’ is starting to form buds. Several types of lavender are in flower, which delights the bees. Perovskia (Russian Sage), echinacea and bee balm were introduced last year into some additional areas and they seem to have adapted equally well around the garden. 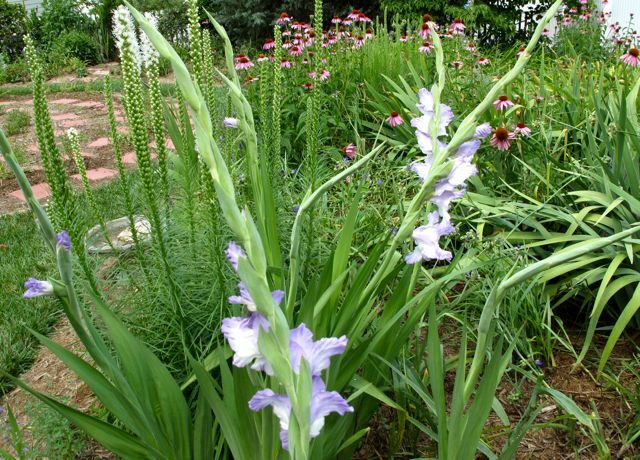 This entry was posted in garden and tagged daylily, deer, echinacea, gladiolus, lantana, liatris spicata 'alba', Mexican salvia, Perovskia, rudbeckia hirta, shasta daisy, sweet pea, tradescantia, yarrow on June 16, 2011 by pbmgarden.